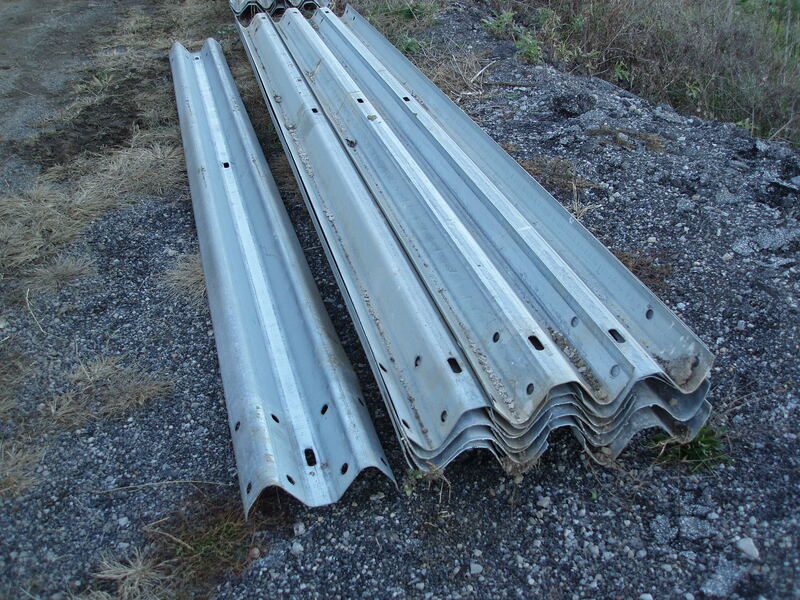 Traditional 12 ga. W-Beam (12 inch) guardrail panel is the standard workhorse of the Highway Safety industry and has performed exceptionally for decades. W-Beam will certainly be a fixed part of our national landscape for over a century. W-beam guardrail derives its popularity and usefulness from a super-durable make-up and an amazing flexibility, both as a barrier beam and as a building material panel. Standard Quality Used Highway Guardrail fresh removed from Roadside, ready to be stacked, sorted, packaged and shipped to our customers all over the nation and the world. All over the globe, thousands of lives have been saved due to the impressive performance of this solid steel fencing component. Every American has benefited from the strength of W-Beam guardrail panel, either as a crucial safety component, or in one of the many re-tasking, cost-saving applications in which W-Beam is applied once it is removed from our national highway system. Our W-beam is available in both “A” and “B” Grade qualities and can be used in the follow applications: Industrial Safety, Erosion Control, Agricultural Fencing, Livestock Fencing, Feed Bunk Construction, Bridge terminals, Traffic Flow-Pattern Barrier and Fencing for protection of private property. It is also commonly used in Homeland Security, Wind Break Panel, for Metal Decking, in Building Construction, Wall Reinforcement, general Structure Protection and Traffic Safety Barrier. W-beam is one of the most available and most flexible materials we provide to the entire nation. The name “W-Beam” comes from the cross-section of the beam itself, which forms the shape of a “W” due to the double rolled corrugations which form the panel section itself. It may also been called “12 Inch Panel” or “12 inch wide” panel. At the 12 gauge (.105 inch) thickness and well-galvanized, W-Beam is an amazingly long-lasting product. We are confident that you will find this product as strong, safe, durable, effective and exceptionally long-lasting of a work-horse as it has been for the road safety industry for decades. We expect to provide you with the absolute best prices an options for used w-beam guardrail for sale in the entire nation. If you would like to discuss the vast possibilities of using W-beam guardrail panel on your project, please give us a call or send us an email today.